Charles Henry Sewell of 20 Hound Road, West Bridgford:- 2 1/2hp Cripps motorcycle weighing 112lbs licensed for private use. This page was added by Website Administrator on 02/09/2014. 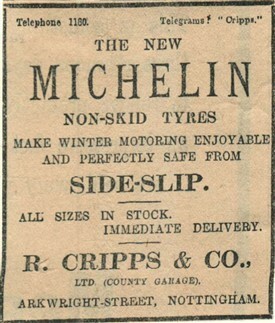 The West Bridgford address for R. Cripps would be Millicent Road. There are in fact no streets in West Bridgord - only Roads, Groves, Boulevards etc etc. The original sellers of the land would not allow the word "Street".